Sunset Cabin, watch the sunset over the north Devon horizon in this cosy cabin! Forget a room with a view, how about a cabin with a view, and a hot tub too! The clue is in the name - after a long day exploring north Devon this is the perfect place to unwind, with a glass of something nice, while watching the spectacular sunset! Sunset Cabin has the most wonderful sunset views that will take you breath away. Followed by a clear night with the most beautiful starry skies, this truly is a special place. This self catering cabin has 3 bedrooms that comfortably sleeps up to 4 adults (in 2 double beds) and 2 children (in bunk beds). The two double bedrooms are both good sizes, one with an ensuite shower room, and there is one family bathroom. There is a smaller bedroom with bunk beds to sleep 2 children. Towels and linen are provided. The kitchen is fully stocked with all that you'd expect including a kettle, toaster, microwave, oven. The living room is comfortable and cosy ... especially when the log burner is lit! We are very dog friendly and doggies are welcome to stay. Please note that dogs must be kept off all furniture, muddy paws must be cleaned before entering the cabin, and all dog poo must be picked up from the garden and paths. There is an additional charge for more than 2 dogs. 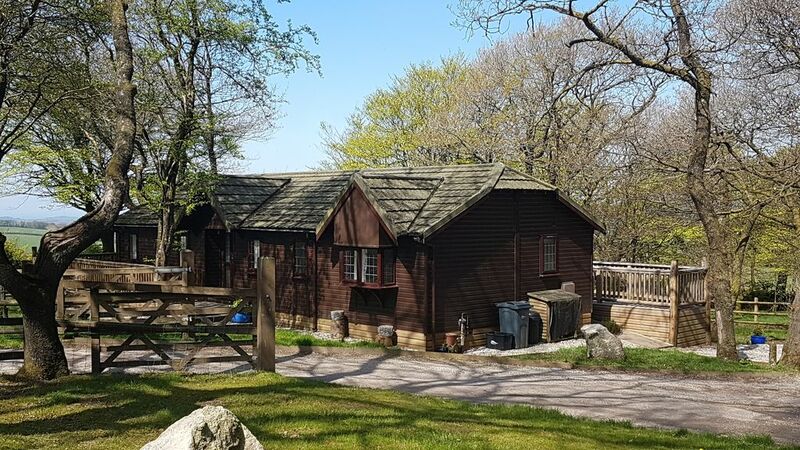 There is gated off parking for cars and an enclosed garden although you are welcome to explore the 20 acres of magical countryside at your leisure, which includes woodlands, a lake and an iron age hillfort. On a clear day you can see sea views to Hartland Point in Cornwall! There is plenty to see and do in north Devon during your visit, with both the coast and Exmoor national park just 10 miles away. Why not try your hand at surfing at the nearby beaches such as Croyde, Saunton Sands and Woolacombe, or hire a bicycle and ride the famous Tarka Trail, or go hiking in Exmoor, or walk the spectacular South West Coast Path? Other attractions to visit include Arlington Court and Castle Hill Gardens that are also very close if you like to explore National Trust properties, or for something different you could visit Quince Honey Farm in nearby South Molton. There’s plenty for kids too, such as the Exmoor Zoological Park, Milky Way Adventure Park and Combe Martin Wildlife and Dinosaur Park. Surroundings and cabin were perfect for our short break. There are lots walks, sites and seafront towns to visit nearby. We were spoilt for choice and loved the hot tube at the end of day to relax. Spacious, quiet and great views! Myself and my partner had a lovely few nights at the cabin. It was much larger than we expected. Great sunset views a nice walks in the area. We enjoyed playing with the owners dogs also! Very friendly owners and excellent communication from the beginning. We will definitely return. Lovely stay at Sunset Cabin. Made to feel very welcome by Matt & Pru .The cabin was very clean & contained everything we required. The. Hot tub was an added bonus. Many thanks! Thank you for your feedback, we are so glad that you enjoyed your stay and the hot tub! Do think of us if you ever plan a trip back to north Devon in the future.